On Saturday 6th August, the Roofing Racers team – made up of competitors from across the Roofing, Building Plastics and Windows industry – well and truly earned gold medals for all their efforts and incredible fundraising. The team put in an amazing performance along with over 10,000 elites and amateurs, as they competed in the biggest triathlon in the world – the AJ Bell London Triathlon. With competitors giving it their all and over 30,000 spectators, it was an incredible day. 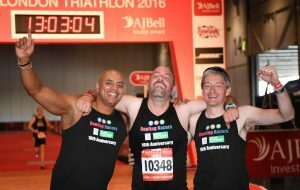 In its tenth year, Roofing Racers are proud of their efforts; having raised over £460,000 for their much loved charities – Great Ormond Street Hospital and Macmillan Cancer Support. 2016’s target is to raise a further £50,000 for both charities, and the team are doing all they can to make sure they smash this target. This year, an amazing 41 individuals and 21 Roofing Racers teams took part. Some were old hands, some were nervous first timers, whilst others were simply sports enthusiasts who couldn’t resist getting involved. However, they all had one thing in common, each gave their absolute best. Clad in wetsuits, lycra and trainers, they threw themselves wholeheartedly into the spirit of the competition and attacked the course full of enthusiasm – completing the 750m swim in the Thames, followed by a 20km bike ride, and a 5km sprint to the finishing line in true Roofing Racers style. The event provided a rare opportunity for the construction industry to come together as a united front to enjoy fun, friendship and fitness, and it was a day not to be missed! The teams were supported every step of the way by colleagues, friends and families, and by the impressive crowds. Whilst some Roofing Racers enjoyed achieving their personal best, others relished the achievement of having competed for the last ten years. Many others were simply bursting with pride for having completed their first ever triathlon. Special credit is extended to the following Roofing Racers who gave outstanding erformances; Bernie Fyans became Roofing Racers’ fastest individual man – achieving an impressive time of 01:17:00, and the fastest individual woman was Ellen Curtis with 01:33:30. Meanwhile, Marcus Lightfoot, Grant Holmes and Frank Van Beers from Ubbink represented the fastest Roofing Racers’ team with an extraordinary time of 01:25:35. After the event, more than 230 Roofing Racers, along with friends, families and colleagues, boarded the Dixie Queen boat and took a trip down the Thames – even those who had swum in the same river just a few hours earlier! Great fun was had by all, with dancing late into the night and everyone celebrating the achievements of the day and the last 10 years in true style. Commenting on the day’s success, SIG’s Managing Director, Andrew Wakelin said: “Congratulations to everyone who competed in this year’s event and made the tenth anniversary of Roofing Racers a day to remember. Thanks also to all the fantastic supporters who always help make this occasion even more special. We were pleased to see an amazing number of members of the Roofing, Building Plastics and Windows industry come together in this challenging event, and their sense of camaraderie was second to none. “As every penny counts for our charities, we really need to hit this year’s target of £50,000. Fot those who haven’t yet sponsored Roofing Racers, there’s still time to pay tribute to fellow industry colleagues and help make a difference to many peoples’ lives,” adds Andrew.